I am not one of those artists (or writers) who is able to go to the studio every day and create. There are seasons of my life where creative pursuits are excruciatingly difficult, like earlier this summer. So instead, I painted the interior of my house. House painting is my form of meditation — even prayer. 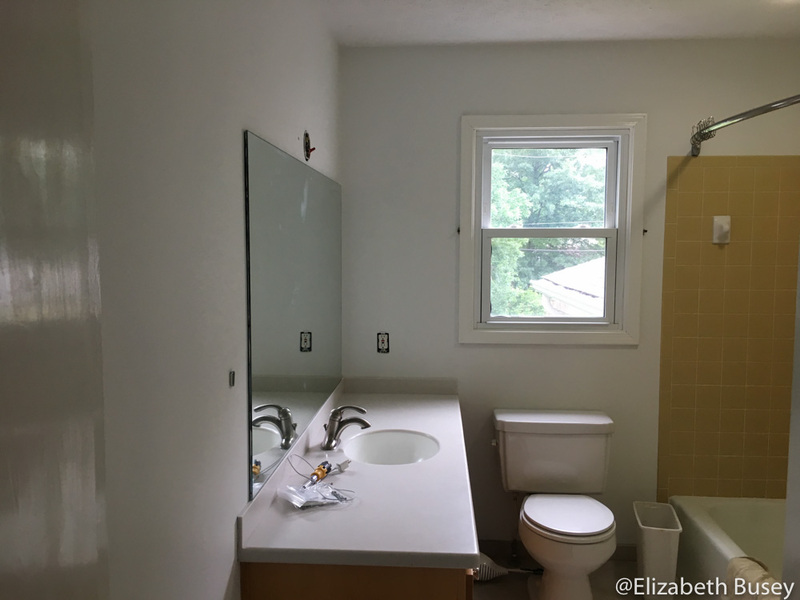 Two bedrooms later, and I realized that the main bathroom could use a make-over. My main bathroom, newly painted a fresh white. The vintage 1970s gold tiles sadly must stay. What to do with all those sample paints? 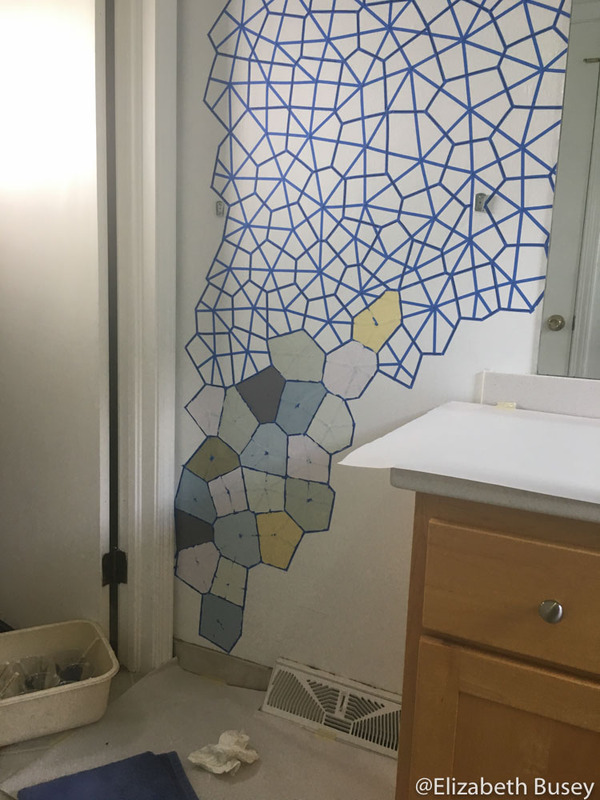 I realized that I had ten small sample cans of paint from my various projects, and set a challenge for myself to create a mural in this otherwise nondescript bathroom. The design must also harmonize with the 1970s vintage gold tiles which are sadly staying. I am fascinated by nature patterns and their mathematical foundations, so while doing some internet research, I came across Delaunay triangulation and Voronoi diagrams. (Click on these links for more mathematical explanations.) These constructions explain many patterns in nature including air bubble packing and leaf cellular structures. 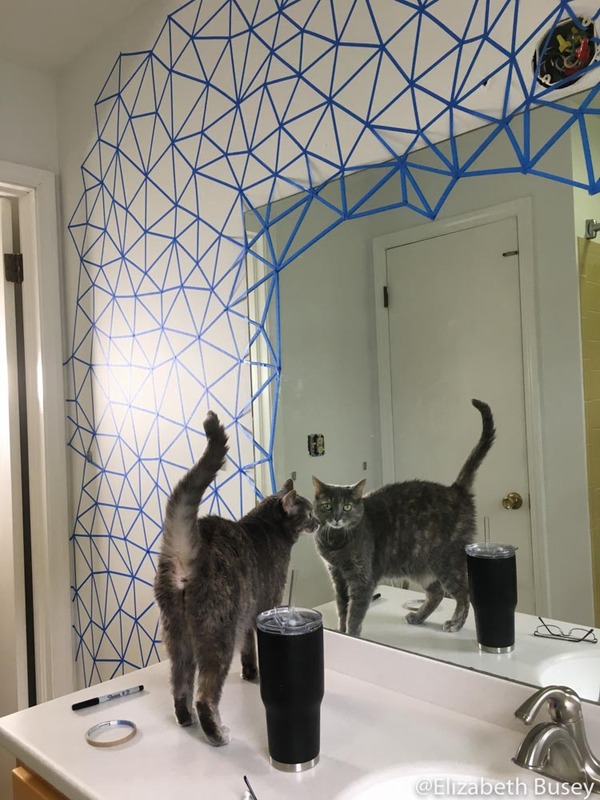 My cat Gingersnap thought this project was fabulous, but needed more treats. I started the process by drawing random dots lightly on my white wall. A mathematician friend pointed out that humans can’t actually be completely random, and he’s right. I just tried not to make them regular. 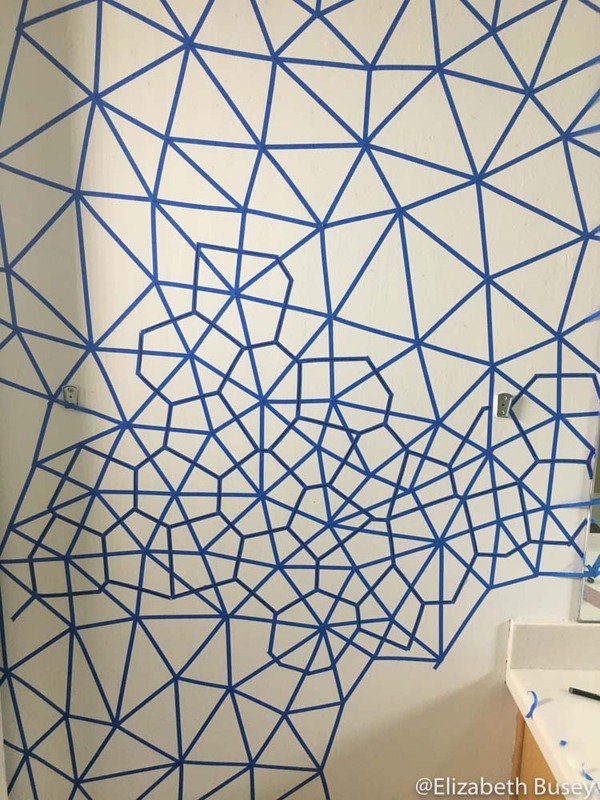 Then I used 1/4 inch painter’s tape to connect the dots into triangles that had the smallest sides possible. I overlapped on the mirror a bit so that my design would seem to grow out of the mirror. It took a lot of measuring to find the midpoints of all of the triangle sides and then perpendicular bisectors of each midpoint. Next I used a clear ruler to find the midpoints of each line of each triangle, and marked this on the masking tape. Then I lightly drew pencil lines perpendicular to each of these midpoints. The intersection of these perpendicular lines was a new point — usually inside the triangle but not always. I connected these new points, and they created polygons. My intention was to paint these polygons with the various colors of sample paint, which were surprisingly harmonious. I traced the polygons with Sharpie marker so I didn’t get lost. Painting the polygons took one day for each coat of paint. I chose seven colors of sample paint, including a new gold paint that would harmonize with my tiles. The darkest color reads as almost black in the images, but is really a dark purple. It took two coats of paint to make sure the polygons were saturated with color. Now the fun part begins! About an hour after I finished the second coat, I began carefully peeling off the painter’s tape. From all I have read, this is the best timing to avoid pulling up the paint. I needed to touch up some places where the paint bled through the tape. Here is the completed wall. It is amazingly difficult to take an accurate image of this narrow space. See the video below to get a glimpse of the entire wall, including where the design wraps around a corner. Is my bathroom great art? Probably not. Was it therapeutic during a time when I couldn’t do my studio work. Absolutely. Now I have a new tool in my toolkit that was instrumental in my explorations at Penland School of Crafts. Stay tuned for more about me and the painter’s tape in my next blog. 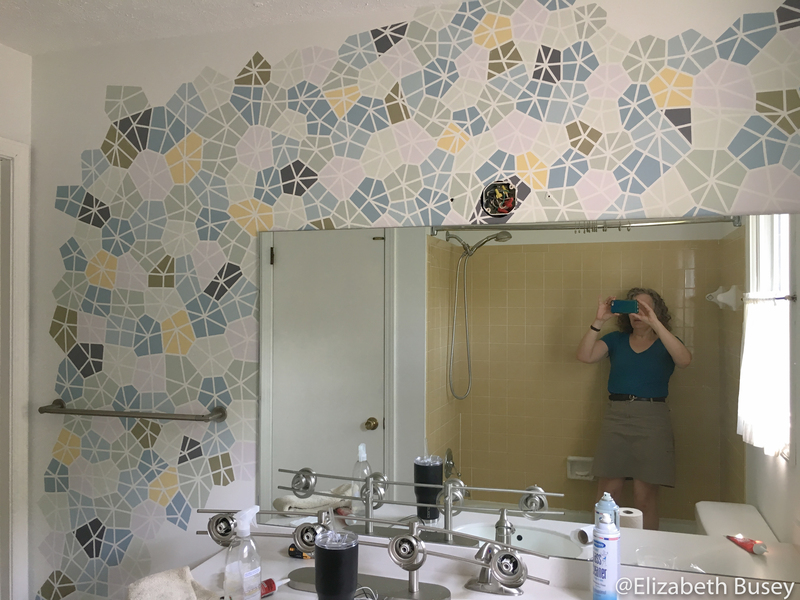 This entry was posted in Experimentation, Inspiration, Uncategorized and tagged Delaunay triangulation, interior decor, masking tape, mural, painter's tape, Voronoi on August 14, 2018 by Elizabeth Busey.